In this clip, Senna just destroys this qualifying lap in Spain, displaying incredible control and focus. There are two ways Senna could have handled this Japanese TV appearance. He could, like so many athletes, have gone through the motions and done the bare minimum to fulfill whatever obligation he had towards them. Or, he could have fun with it and get weird. We should all be thankful he chose to do the latter. Senna clocks in a full 1.7 second faster than his opponent and rival, Alain Prost, in this 1989 Suzuka qualifier. This lap from the 1993 Grand Prix at Donington Park might have been Senna at his finest. They say when it rains, it pours. And when it pours, Senna passes 4 other drivers. 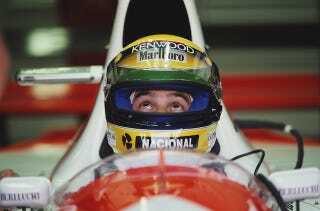 Wanna know how good Senna was? At 1:07, he doesn't even need to lift off the throttle. And finally, the view of Senna that most of his competitors got to see: the back of his car. This onboard camera belonged to Gerhard Berger, who chased Senna for most of the race, but couldn't ultimately overtake him.